This stunning recycler from Grace Glass is made to a superb standard from top quality borosilicate glass, making it heat resistant and extremely tough and durable. The recycler is equipped with an harm chamber and a double rotating percolator for crazy bubbling effects an extra smoother sensation during your sessions.This waterpipe stands 34cm tall atop the thick, round base of 20mm. 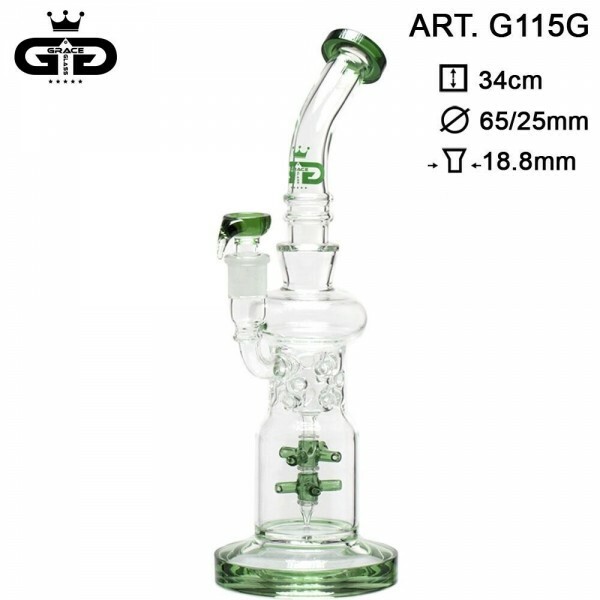 The base, mouthpiece, the double percolator and bowl are all made from stunning green coloured glass. The perfect piece for your collection!